The courses develop important skills for your organization’s employees. Organizations that embrace Lean Six Sigma typically emphasize the concurrent development of leadership, change management, team management, and data-driven decision-making skills. For this reason, our Lean Six Sigma training courses are built around these important skill sets. Training participants learn to link tactical process improvement efforts to enterprise strategy and objectives. What’s more, they learn how to build and lead high-performance, cross-functional teams. Lean Six Sigma professionals learn to communicate using hard data to make decisions. In this way, communication barriers are overcome and measurable improvements are clearly communicated throughout the organization. Teams learn to conduct improvement activities using universally accepted roadmaps and manage those activities to completion. Thus, Lean Six Sigma practitioners are more capable of getting the best possible results. Our courses teach participants how to select the right tools to quickly analyze data, understand root causes and solve complex problems. 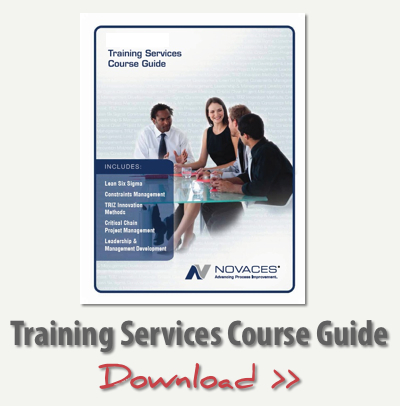 NOVACES is committed to providing on-site training for your organization at a price that is up to 75% less than the cost per person to send individuals off-site to open enrollment training. And with the important services that we include for no additional cost in the the training package, you will achieve a much better return on investment. 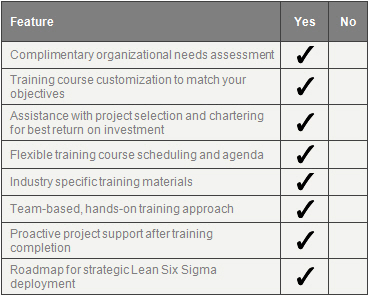 Click here to find out more about our Lean Six Sigma training services.